Mimosas are evergreen or deciduous flowering trees, plants or shrubs that produce silken flowers with long, slender, flexible filaments resembling small pom poms. They belong to the legume family, as evidenced by the bean-like seed pods they develop in late summer. There are many cultivars of mimosa plant, and at least four of these grow in Florida. Mimosa alba is a white flowering tree-form mimosa that has a wide and low spreading canopy reaching up to 25 feet in height and 35 feet in spread at maturity. The 2-inch diameter fragrant flowers appear in April and remain on the tree into July. They are pure white and have the same silk-like texture endemic to the species. The Mimosa alba has fern-like foliage with 60 small, matte, green-grey leaves on each stem. The tree lives for roughly 10 to 20 years. 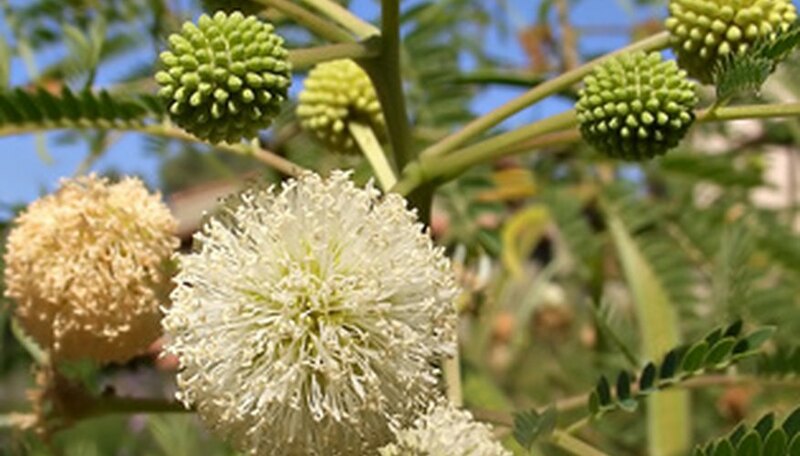 The Mimosa albizia julibrissin is a pink flowering tree-form mimosa that has a spreading canopy and reaches up to 25 feet in height and 35 feet in spread at maturity. The 1 1/2- to 2-inch diameter fragrant flowers also appear in April and remain on the tree into early July. This cultivar has flowers that range from a light pink throughout to lighter in color in the center and darker cerise pink at the edges. It has the classic fern-like mimosa foliage in hues of green-grey with a matte finish. Two species of mimosa are native to Florida and have a low growing shrub or groundcover form. Mimosa strigillosa, known as powderpuff and sunshine mimosa, has small, purple-pink silky and round flower heads that are 1 inch or less in diameter. Mimosa quadrivalvis, commonly know as Florida sensitive brier, is a similar to powderpuff but has fine flexible spines along the stem and smaller, less showy flowers. Both bloom in spring, create dense mats of foliage and are drought tolerant. Seed pods develop in the summer and fall and open up to self-sow in winter. What Is a Mimosa Plant?